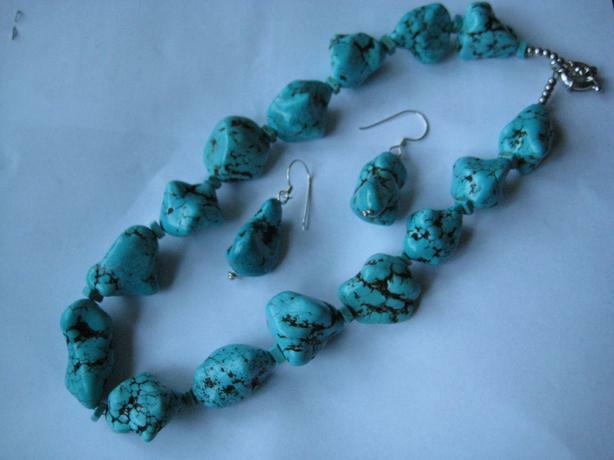 Here is a beautiful Turquoise 15 stone Necklace and matching Earrings ~ from Cambodia . Perhaps the oldest stone in mankind's history , turquoise is a stone of protection ~ the Talisman of Kings , Shamans and Warriors . Strong and opaque , yet soothing to the touch and healing : " As if carved from an azure Heaven , and slipped to Earth ..."